Sew what's cooking with Joan! 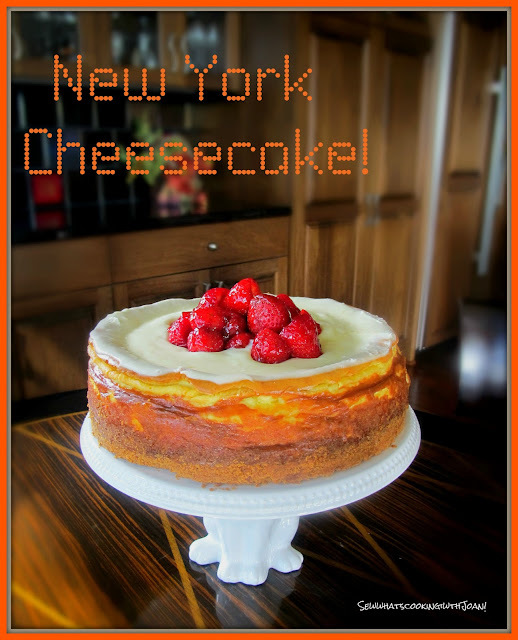 : New York Cheesecake with local fresh strawberries! New York Cheesecake with local fresh strawberries! There are foods that bring me back to my childhood. Foods that my grandma’s, aunts and my mom would make for family gatherings. I can close my eyes, and can picture myself there. The dining room table filled with food, and a train of relatives carrying plastic trays and paper plates making their way around the spread. Our family gatherings were always large, with lot's of laughter and fun. It’s the late 1960′s. I can see the harvest gold shag carpet. I can feel my too short bangs, which were freshly cut by my Mother. My uncles and dad will soon retreat to sitting in the living room watching stock car racing on the TV, while the ladies gossip and swap recipes in the kitchen. My cousins and I would play "kick the can" and "King of the Haystack" out around and in the barn. Good memories and good times! 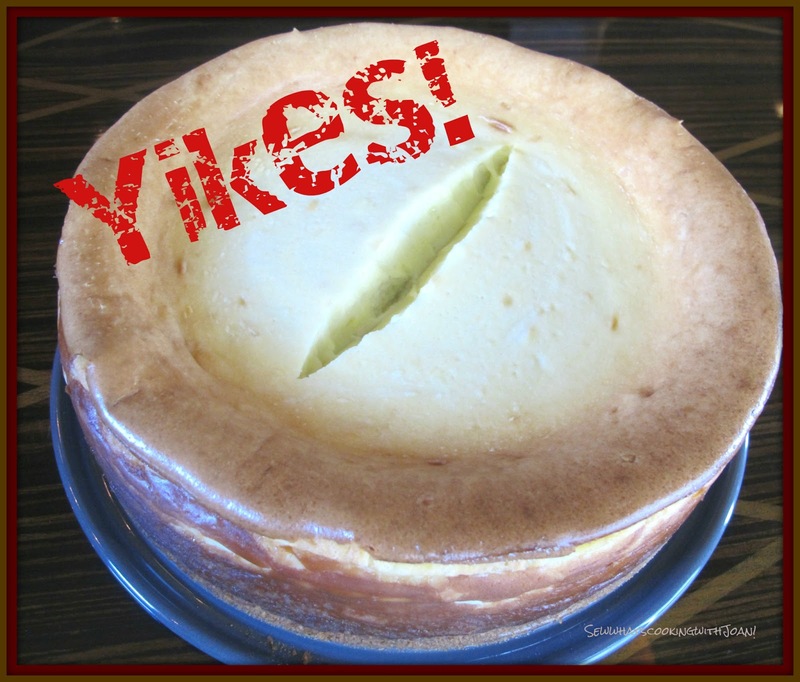 I have made many cheesecakes and do not find them challenging at all. But when I rushed the cooling time and looked in the oven to see that my cake had cracked, I was not happy!! However, I am not going to cover and pretend it didn't happen. I am going to show you that I am human, and that it can happen to anyone. I am going to explain why and how to fix it! My sweet daughter, Tink, who happen to be here when it happened, says, "your readers need to know you are human and real!" She and I were having a lovely time chatting about the upcoming birth of my grandchild, Madison, and of course working on decorating the nursery and picking out various hand knitted hats off Etsy! Cheesecake takes a long time to bake and cool so plan ahead. But it promises to be divine and nobody will notice the crack because I will cover it with a lovely layer of sweetened topping and strawberries, just like Mom likes it. Plenty of strawberries! I'm telling you this to encourage you to cook and try new things. Even the most professional and experienced cooks make mistakes. It's normal, we learn and go back to bake another day. Just one thing, make it the way the recipe says the first time. Later on you can adapt and make it your own. That way, you will completely understand the process. Butter a 10" springform pan. Mix graham cracker crumbs with butter and spread evenly on bottom of pan. Refrigerate while preparing the filling. Beat cream cheese until very smooth and light. Add sugar, lemon zest and juice and beat again. Beat in vanilla and cream. Add eggs, one at a time. Pour in prepared pan and bake for 40 minutes or until the sides look dry but center is still glossy. Turn the oven off and don't open door. Walk away!! Leave for about an hour, then open the door slightly and cool down for 1 more hour. 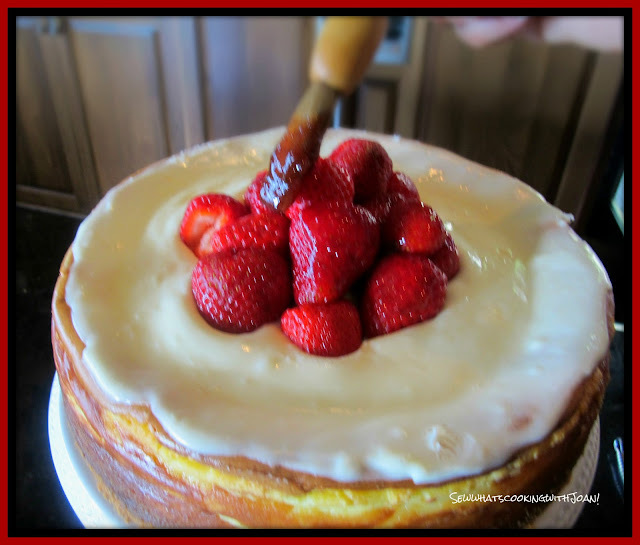 You can cover the crack with just strawberries piled into the center of the cake. You can use this topping to cover a crack as well or by itself. Put all the ingredients in a small Cuisinart Food processor and whip until smooth and slightly thickened. Do try this cheesecake, it is quite a showstopper! They will think you spent hours in the kitchen when in reality it is a little mixing and a lot of waiting. Take it out of the refrigerator at least an hour before you serve it and make sure you plan to make it the day before. Our entire family showed up for the barbeque pot luck dinner at Mom's. Allie my niece brought her delicious salsa that she is famous for, Sarah brought a delicious Lemon Orzo salad, Stephanie brought a Spinach and Strawberry salad, Tink and Nate Dog made grilled vegetables, Debbie made baby back ribs, Sweet One brought her Ice Cream Cone cupcakes (minus the cone) and I made barbequed chicken, Cheddar Bay Biscuits and New York Cheesecake! She was thrilled! She loved all the delicious food that was brought! 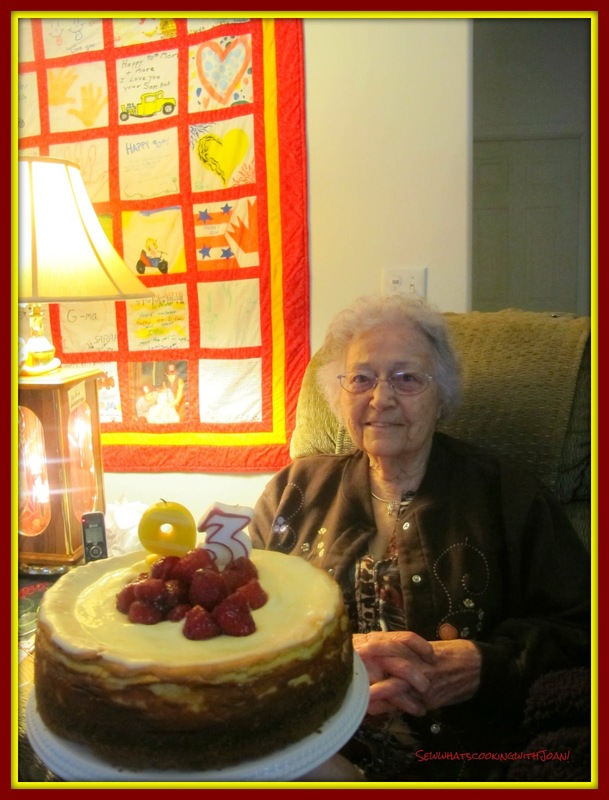 The quilt I put together for Mom's 90th Birthday is in the back ground. Each of the family member's made a square at the family reunion the Summer before her 90th. I provided permanent fabric markers or selected photo's and transferred to fabric. 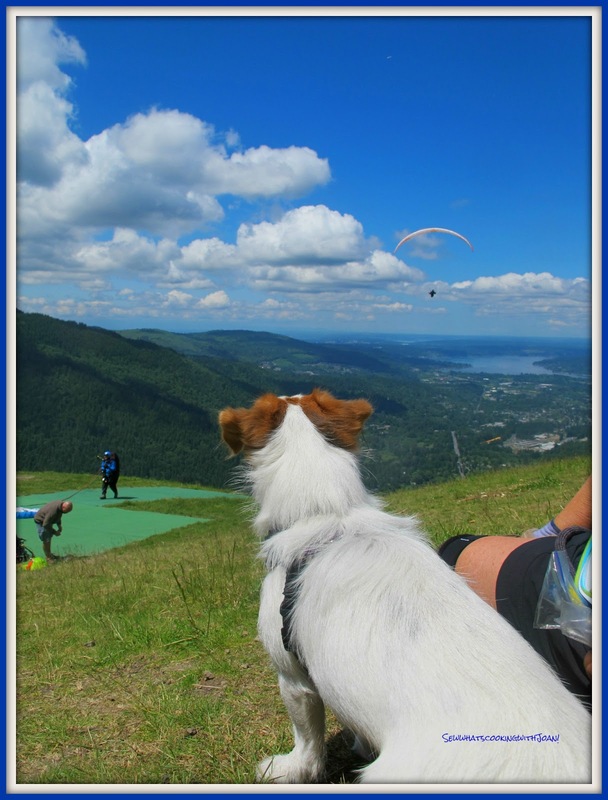 Summer is here and our family has so many exciting adventures we are about to embark on! Hike week was fabulous and I had many reports of lost weight and inches!! Yippee! Here are a few photo's of the last couple of hikes. Poo Poo Point is one of our favorites as the reward is huge at the end. Where many paraglider pilots learn to fly their featherweight crafts. In between, you'll find wonderful old forests to explore and a grand path to follow. Bandit was very intrigued with the action! This photo was shown on KOMO TV news the morning after I took it! I was thrilled and surprised! Rattlesnake Mountain is a 10.2 mile hike I have wanted to do, but, we didn't get to it last year. It requires parking a car at both ends. With my friend Jane's sweet husband Jim, we were able to do this. 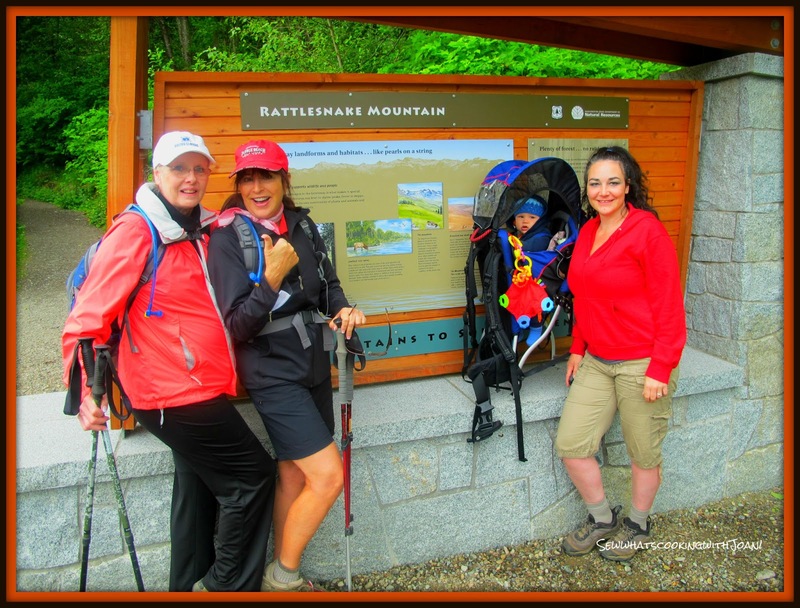 We enjoyed fantastic views out over the Snoqualmie Valley, Mount Si, Mount Teneriffe, North Bend and more. Enjoyed eating our lunch at one of the benches with views along the way. Allie, my niece hiked with her son Ryder, packing 20+ pounds. she is a super hiker!! Waiting for us at the end of our hiking day, Jane's husband, my friend, Jim! 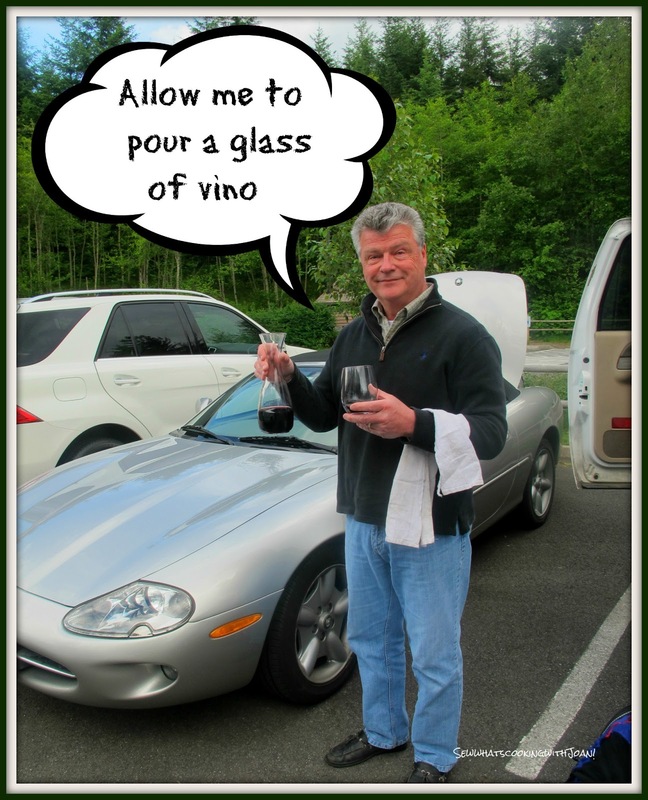 Thank you Jim for helping and for the delicious wine!